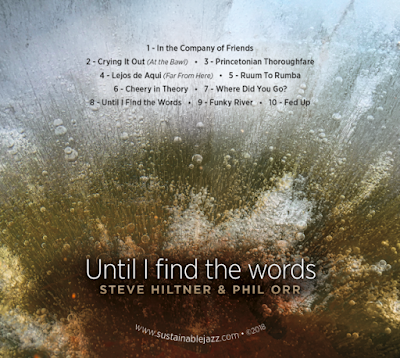 Phil Orr, the Sustainable Jazz Ensemble's first pianist, has released two excellent CDs of his own arrangements and compositions, all beautifully done. He offers new music in the form of originals, and imaginative takes on the "Advent/Christmas/Epiphany" traditions. Like Phil, this music is good company. Check it out on his website. Buy a CD--or two!---I finally recorded not one, but two solo piano projects. Mutual Admiration---Philip Orr plays Philip Orr is a conspectus of jazz originals, intimately recorded on a responsive Steinway concert grand Some of these you may have heard at previous recitals and concerts but some of them are showing their smooth, unblemished skin to the light of day for the very first time. Engaging Mystery: Bethlehem Revisited is Advent/Christmas/Epiphany music ancient and modern, in new guises or with none at all, sincere and straight-forward. at the new Philip Orr, Musician website, www.philiporrmusician.com. News, music (audio and printed) and biography---simple and sweet. Take a spin and let me know what you think!